Spoilers for Arrow. Warning: This episode contains darkness, violence, and death. Team Arrow has successfully destroyed Darhk's Ark and stopped Rubicon's missile launch. However, Darhk still wants to destroy the earth, Ark or no Ark, and rid the world of humanity. In order to stop Darhk, Oliver and the team will have to learn to become something else. Darhk demands that Felicity help him turn Rubicon back off. She refuses so Darhk tosses Curtis to the side and threatens to kill Donna, slowly and painfully, by snatching her life force out of her. Fortunately, Oliver arrives. Darhk releases Donna. Oliver shoots an exploding arrow at Darhk, but Darhk stops it mid-air and causes the explosion to implode into itself. He's powered by ten thousand souls--they can't stop him. Ghosts arrive to take out Oliver, but Oliver evades capture and stops them while Donna and Felicity cower from the gunfire. Darhk tries to take Oliver's life force, but Thea and Diggle arrive with Darhk's daughter. Thea threatens to kill her if he doesn't release Oliver. Darhk lets go, and Thea releases Darhks' daughter. Darhk throws a flash bomb to blind them while he makes his escape. He takes the laptop that holds the anti-Rubicon program on it. He can launch the nuclear weapons! Darhk: "I'm now powered by the deaths of tens of thousands of souls. There's nothing you can do to stop me." Oliver rushes to Curtis' side. They take him to the Arrow cave and stabilize him. Felicity asks Oliver why he can't stop Darhk anymore. Oliver says Darhk is much more powerful than before and Felicity's hope in Oliver is not enough. Lyla arrives, and they update her on the situation. Felicity tracks her laptop's GPS to an office building. Team Arrow arrives, but there's nothing there. They find the GPS tracker ripped from the laptop and lying on a table in the middle of the room. The room's power turns on, and computer screens reveal that the nuclear missiles have launched. Felicity continues to hack the missiles, but she doesn't make much progress. A nuclear missile was launched short-range toward Star City, which gives them forty-five minutes to stop it. Lance arrives, and Felicity makes him promise to take her mother to a bunker. Lyla and Diggle call Sara, who has been taken to an ARGUS safe house. Lyla says they have a chopper waiting to take them to her if they can't stop the nukes. Diggle doesn't have much hope that they will stop the nukes. He hasn't had much hope since the incident with Andy. News reports cover the destruction of the Ark, the threat of the nuclear missile, and the chaos taking over the streets of Star City. Team Arrow starts cleanup on the Arrow cave. Oliver admits to Felicity that he still blames himself for Laurel's death. Curtis wakes up and gets up to help, despite their protests. He says someone has to be optimistic. (I love him. More Curtis, please!) Then he tells Oliver that he and Paul were planning to leave Star City until the Green Arrow reminded them that this city--their home--was worth saving. The Green Arrow inspired hope in him, and he can still give them hope now. Curtis: "Look, living in Star City requires a special kind of tenacity. A sane person wouldn't live here. It's a fact that Paul likes to remind me of weekly. We were this close to leaving Star City last October. After three terrorist attacks, we were done, but then the night before we were going to start packing, the Green Arrow popped up on our TV, and he reminded me that this city is worth saving. That my home--that my home was worth fighting for. That guy gave me inspiration. He gave me hope. And if he could give me hope then, why can't he give it to others now?" Out on the streets, people are in a frenzy--running, freaking out, writhing in chaos. 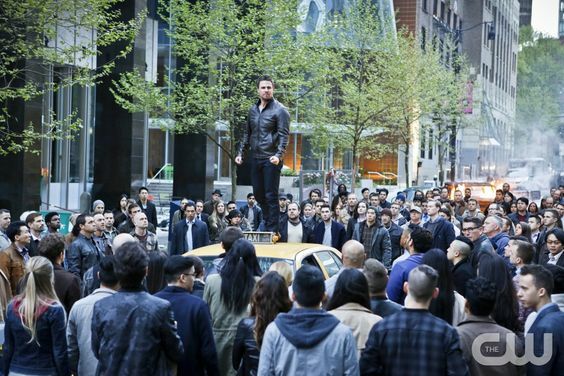 Oliver climbs atop a taxi cab and calls out to the crowd. The people quiet down, listening to his speech. He gives words of hope to encourage the people that Star City is worth saving. (Really, Oliver has been nailing it with fantastic speeches this season. Look at all this character development, people!) Team Arrow listens to his speech from the Arrow cave. Lance and Donna listen to the speech from their car as they travel to the bunker. Oliver: "This is our home. This is our home! It is our friends, our family, our lives, and we will not--we will not throw those precious gifts away by descending into chaos. We will look to each other for hope. We will cling to each other for strength, and if we do that, then we can all stand here united." The nuke arrives, and Felicity and Curtis figure out a way to hack the signal at a close range and tell the nuke it's already hit it's target so it'll explode outside of Star City. It works. The nuke flies away. But as they return to the Arrow cave, they realize there are 15,000 more nukes in the air. Felicity tracks down Darhk's hacker. Diggle volunteers to stay behind to help while the rest of Team Arrow stops the hacker. Oliver, however, goes to City Hall to deal with Darhk. Diggle tells Lyla the truth about Andy. He thinks he's a monster, but Lyla says he had to do what he had to do--it was war. Oliver confronts Darhk in the chamber. Darhk tosses Oliver through the ceiling and onto the streets above. They fight. Thea, Curtis, Felicity, and Merlyn find the hacker. They fight off the Ghosts guarding the building. Darhk tells Oliver they can't stop the nukes. He says he's giving everybody a mercy killing--letting people die in a flash so they don't have to live without the ones they've already lost. Darhk: "Fifteen minutes until the end of the world and you want to spend them with me. I am touched." Oliver: "It's not so easy without the magic, is it?" Damien: "Oh, I don't need magic. I'm a former member of the League of Assassins, or have you forgotten that?" Thea, Felicity, Curtis, and Merlyn find Cooper cooped up in front of a computer. He looks terrible. His fingers are bleeding, and his face looks haggard. He tells them Darhk has a bullet slowly moving up his spine. If he does what Darhk wants, Darhk will make it stop. If he doesn't, Darhk will kill him. Felicity asks to talk to Cooper alone. Cooper apologizes. He says he's not strong enough to step away from the computer, but Felicity says he is strong enough and he's better than Darhk. She tells him that he can save the world, just like he always wanted to. Cooper pushes away the keyboard. Darhk senses Cooper's shift, and he kills him. Felicity apologizes to Cooper and sits down at the computer. She tries to stop Rubicon once and for all. Oliver and Darhk continue to fight. Diggle and Lyla arrive to help, but Darhk's Ghosts arrive also. The people of Star City charge the Ghosts. Thea, Merlyn, and Curtis come back in to help Felicity. She tells them they have three minutes to stop the nukes, but she doesn't know how. Curtis tells her to reverse the horizon so the nukes will explode into space. Among the chaos in the street, Darhk picks up Oliver's bow and an arrow. He shoots Oliver in the shoulder. Lance arrives and helps Oliver to his feet. He said he heard Oliver's speech, and it convinced him to return to help save the city. Oliver and Darhk fight again. Oliver knocks Darhk down and picks up an arrow. He grabs Darhk, but Darhk says Oliver won't do it--Oliver spared the life of Slade Wilson, who killed Oliver's own mother. Oliver says Darhk killed a close friend and ten thousand people. With Slade Wilson, he had a choice, but with Darhk, he doesn't. Oliver stabs Darhk with the arrow and lets go. Darhk falls back to the ground, dead. Damien: "What are you going to do now, Oliver? Stop posturing. We both know you can't do it. You spared the life of the man who killed your own mother. Oliver: "And you killed a friend of mine. You killed tens of thousands of innocent people. With Slade Wilson, I had a choice. This time I don't." Oliver: "John, you're the one who keeps me in line." Diggle: "Oliver, I don't know if you've been watching lately, but it's been the other way around, man." More prisoners arrive just as Oliver kills Taiana. They point their guns at him, but Oliver explains the idol was taking over her and she asked him to do it. He tells them Reiter destroyed the plane, but there is another way off the Island. He calls Amanda Waller and her team comes to rescue them. Oliver buries Taiana next to all the other graves. Amanda Waller gives Oliver a box of his stuff and offers him more missions like this one. Oliver picks up his dad's journal of names and says he has a promise to keep. Overall, this season was kind of a disappointment. The story line dragged. The Island scenes became more annoying than exciting or interesting. There were good moments--a lot of good moments--but as a whole, I'm glad it's finally over. I'm also glad it ended well. I knew they'd stop Darhk (how can a superhero story not end on a happier note? ), but I'm thrilled Oliver is going to be mayor! I'm sad to see Thea and Diggle and Lance go, though I doubt they will be off the show for long. I'm interested to see what they do next. I also think Oliver and Felicity working together will be good, and it might mean new blood will be added to the show. Maybe Oliver can start training someone else. Basically, I'm looking forward to see how Oliver balances being a mayor and the Green Arrow. Here's to season five! Fingers crossed that we finally get the beard and long hair for year five on the Island! What did you think of "Schism"? What did you think of Season Four of Arrow?